We understand that this is a unique way of “shopping”, so here is a little bit more about the CSA model. At the core, CSAs are about building a direct relationship between farms, farmers and eaters, so that you can put a face behind your food, and so that local food systems can thrive. CSA members get to know their farmers, since you will meet us during the weekly pick up. CSA members also get to know their farm and food. Ever wonder what a Brussels sprout plant looks like? Or have you ever tasted cherry tomatoes fresh off a ten foot tall tomato vine? Through farm tours and events, you will get to visit the fields and learn how your food is grown. CSAs are also about an alternative farm-to-eater relationship that is more transparent and educational. By committing to a farm for a season, CSA members help a farm secure some income for the season. A membership base also allows a farm to customize their production in scale and crop selection. 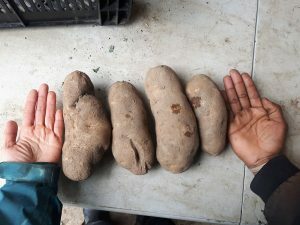 There is less waste, and local farms can respond to the needs of its community; whether that is growing more of members’ favourites, growing unique varieties, and even customizing their growing for specific partnerships or projects. 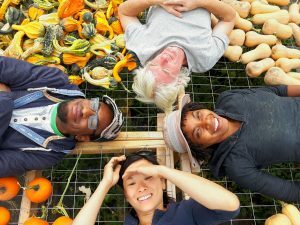 CSAs try to create a true farm community to remind us that we are all in this food system together. 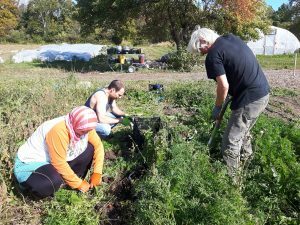 Members support a farm by “sharing the risk, sharing the harvest”, and in return, that farm preserves local soils, green space, and access to safe, fresh, and healthy food for its community. We hope you will join our farm family.